Some free advice to any woo-woos who complain that we skeptics don't take their claims seriously: try not to act like a bunch of raving lunatics. Turning your chosen field of study into some kind of bizarre street theater does not improve your credibility in the eyes of those of us who aren't already convinced. This suggestion comes too late for the Bigfoot enthusiasts, who created a piece of performance art last week that was Harry and the Hendersons meets "the Keystone Kops." This is unconfirmed at the moment and we’re still trying to figure out what exactly transpired here. According to our source, PBS is looking into a possible shooting of Bigfoot somewhere in Pennsylvania. “It has been all over the police scanner in the area,” our source tells us, but he will not confirm the exact location. PBS, I hasten to point out, is not what you were thinking. It's the "Pennsylvania Bigfoot Society." Why throwing in Altoona's nickname was considered important, I don't know. Johnny Bigfoot just posted on his blog that the alleged "Bigfoot shooting" probably took place in Somerset WI -- not Somerset PA or North of Altoona, Pennsylvania as we reported Tuesday. Right! Because (1) a claim becomes more plausible if you can't even figure out what state you're talking about, and (2) we should give a lot of credibility to someone named "Johnny Bigfoot." I mean, really. If I were to claim that I'd seen a live Woolly Mammoth, and someone asked me where, and I said, "I saw it in Ogunquit, Maine! Or maybe Poughkeepsie! Or possibly Nebraska! ", you'd be perfectly in your rights to guffaw in my face. Especially if my name turned out to be "Mikey Mastodon." SOMERSET TOWNSHIP, Wis. - A Washington County Sheriff's commander is recovering at a Twin Cities hospital after being shot while scouting for a turkey hunt in western Wisconsin. St. Croix County deputies were called to the 1900 block of 80th Street in Somerset Township just before 7:30 a.m. Tuesday on reports someone had been shot. When they arrived on the scene witnesses told deputies that a group was hunting turkeys when one hunter fired a shotgun and struck 53-year-old Commander Jerry Cusick. Washington County Sheriff Bill Hutton says Cusick, a 28-year veteran of the department, was unarmed and was walking an area where he often hunts when he was shot. Cusick was transported to Regions Hospital in St. Paul; The Pioneer Press says he is reported in good condition. St. Croix County investigators and the Wisconsin Department of Natural Resources (DNR) are looking into the shooting to determine if criminal charges will be filed. So, the story of a Bigfoot being shot in Somerset County, Pennsylvania turned out to be completely correct, as long as you changed the word "Bigfoot" to "guy" and the word "Pennsylvania" to "Wisconsin." And they wonder why we're unconvinced. I mean, really. First we had Melba Ketchum going off the deep end trying to defend her claim that she'd found Sasquatch DNA, and now we have these folks. 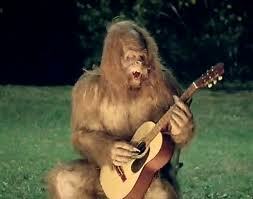 It's enough to make a cryptozoologist sing the blues.